Years ago when someone called me weird or eccentric I used to feel very hurt, ‘how could someone say such a thing to me’, I used to chant to myself. The honest truth is I know I’m weird, I have been familiar with this knowledge about myself since the age of 4. As far back as I can remember I used to think in my head how different I was. I didn’t really see things the way other people did, I didn’t particularly think like they did either. Growing up I was smart enough to know how to make friends, or maybe those people were just drawn to me because of my indifference, never the less I always had good companions around me. My parents worked hard for their earnings when I was a kid, there wasn’t a lot of extra to spend on things that didn’t matter, like clothes I would have preferred to wear instead of the norm. I didn’t know enough how to express myself in those days being a teenager just wanting to fit in, the external part of who I was did a good job of that, but the soul of me was a different story. I could see things that I knew other people couldn’t, my sensitivities were always on fire, I could never shut them off, so I ’saw’ everything, I internalized everything and I heard everything, most of this information confused me when I was young. I used to be deathly afraid of the dark, I didn’t understand why until I realized I was a Medium, and then it made perfect sense, I have a deep appreciation for the dark now. I talked to myself a lot too growing up (I still do), there was two of me and although I didn’t get what that was really all about (I do now), I accepted it, I never questioned it, likely because the two of us were friends, although sometimes we were enemies as well, it was someone to talk to when I was lonely. Speaking of lonely, I was lonesome a great deal of the time. Being weird is isolating, it still is but I have found a peace about it over the years and I appreciate the solitude I create for myself very much. My life has become my work, most of it is behind the scenes, I guess it goes with the territory, as they say. I used to never talk about myself to anyone, I always made my life about everyone else. I completely loved making other people feel loved, in whatever way I could. I am still that same person, only now I have learned to balance what I give, for my own good. What I love the most in my life, is how much fondness I have for the weirdo in me. This intimate acceptance of myself allows me to be a really good Intuitive Healer, I am so very grateful to have come to this earth in this life experience with all of the eccentricity that I call ME. My work at Annanda passionately allows me to be the weirdo that I am, in my sacred space I help teach other people to accept the weirdness about themselves too. The World needs more of these kinds of teachings, don’t you think? It’s always about being the same growing up, but when you get wiser and maybe a little braver, it is all about being different. 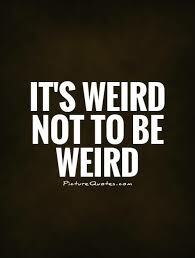 Let your weirdness shine today, go ahead it’s alright, because I am shining right along with you.